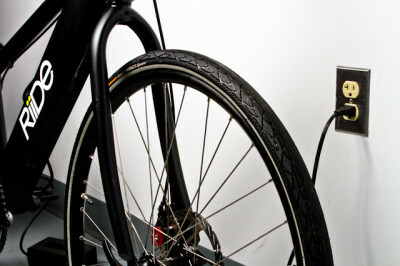 Riide electric bikes charge fully in 2-3 hours using a standard wall outlet. This is half the time of other electric bikes on the market. They say you never forget how to ride a bike. But you may have to learn again if one alumna’s innovation catches on. Amber Wason, a 2007 GW School of Business graduate, is part of the duo trying to make electric bikes, or e-bikes, part of a commuting routine for young urban professionals. Wason and business partner Jeff Stefanis run a local startup called Riide, which beat its $50,000 Kickstarter goal in less than a day earlier this month. The company’s e-bikes, lighter and sleeker than others on the market, are an alternative to taking the Metro, bus or regular bikes, she said. Riide electric bikes charge fully in 2 to 3 hours using a standard wall outlet. This is half the time of other electric bikes on the market. The e-bikes look like and perform the same function as traditional bicycles, but also have a battery-powered motor that can propel the bike at speeds of over 20 miles per hour with a turn of the handle. Riide has been 15 months in the making for Wason and Stefanis. Stefanis, a Georgetown University alumnus, saw e-bikes everywhere when he went on a business trip to China. “They sold twice as many e-bikes as cars last year in China,” Wason said. The duo researched the trend and saw that e-bikes existed in the U.S., but were too heavy and expensive to become popular. They saw this as an opportunity to create a lightweight and affordable e-bike. The business school graduate was part of the Women’s Leadership Program as an undergraduate. A professor from the WLP offered her an internship at the transportation department at the Downtown Business Improvement District, which sparked her interest in urban transportation. Wason hopes students could now use Riide to get to their own internships. She biked to hers at the Southwest Waterfront, an area that was not easily accessible by way of the Foggy Bottom Metro. At $1,799, the bikes still aren’t cheap. But for comparison, Pedego, a leading manufacturer of e-bikes, sells its bicycles for between $2,000 and $3,000. Wason says that they hope to add financing options down the line to make paying for a Riide even more manageable for students. Students will have the opportunity to test the Riide Thursday in front of the Whole Foods on I Street. Riide representatives will be there from 3 p.m. until dark. This article appeared in the January 13, 2014 issue of the Hatchet.